A 5-star hotel located in downtown Bangkok. Unwind in one of 362 fully-appointed rooms and suites and enjoy the uplifting comforts of the Westin Heavenly® Bed and Heavenly® Bath with an uptown view. For those in search of meeting venues, 16 venues totaling over 16,910 square feet ensure the ideal setting for every occasion. The flexible venue portfolio includes Altitude, the stylish high-in-the-sky hospitality space that gives an extra lift to any special gathering, a glorious Grand Ballroom, elegant meeting rooms, boardrooms and more. Wining & dining is always an inspiring experience at both of the hotel’s first-class restaurants. Much favored by Japanese expats for its season-sensitive and authentic cuisine, Kisso has been voted Best Japanese Restaurant in Bangkok. At Seasonal Tastes international buffet restaurant, diners fuel their bodies with delicious SuperFoodsRx™ dishes packed with nutrients and energy. Relax and rejuvenate at Vareena Day Spa, the WestinWORKOUT® fitness studio or take a dip in our refreshing outdoor swimming pool. 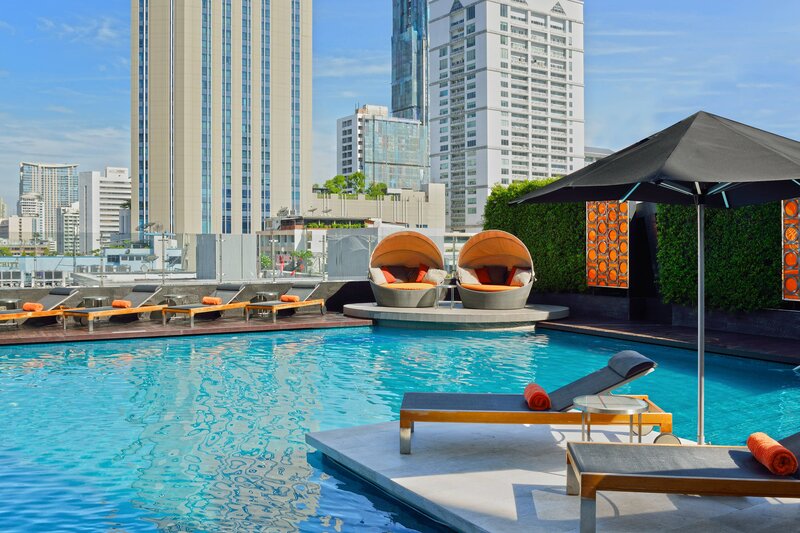 Located in the heart of Bangkok’s vibrant downtown district, The Westin Grande Sukhumvit is directly adjacent to the BTS Asok skytrain station and just steps from the MRT subway station at Sukhumvit. Well-positioned for the city&apos;s cultural highlights, guests are never far from prime shopping, nightlife and business addresses. Bangkok is a vibrant, sophisticated, and exciting city. Known as the “City of Angels,” it is an exhilarating location filled with a feast of attractions – amazing Buddhist temples of wondrous beauty, magnificent palaces, modern shopping centers, world-class restaurants, scenic parks, and a beautiful culture. With 14 venues totaling over 1,725 square meters, the hotel provides the perfect setting and ideal location for productivity and focus. 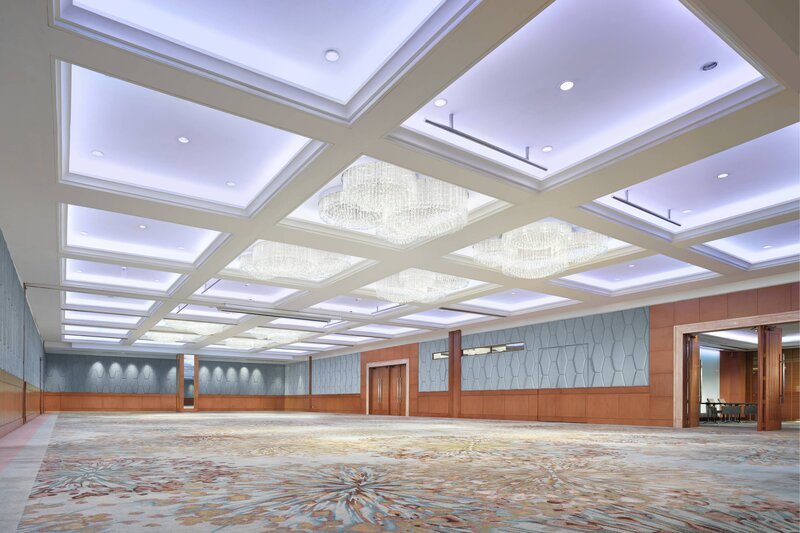 Outlined in elegant crown molding and awash in calming, neutral hues, the Grand Ballroom is ideal for conferences and grand affairs. Altitude, right at the top of the hotel on the 25th floor, is a private rooftop event space that is unique in the Sukhumvit area. 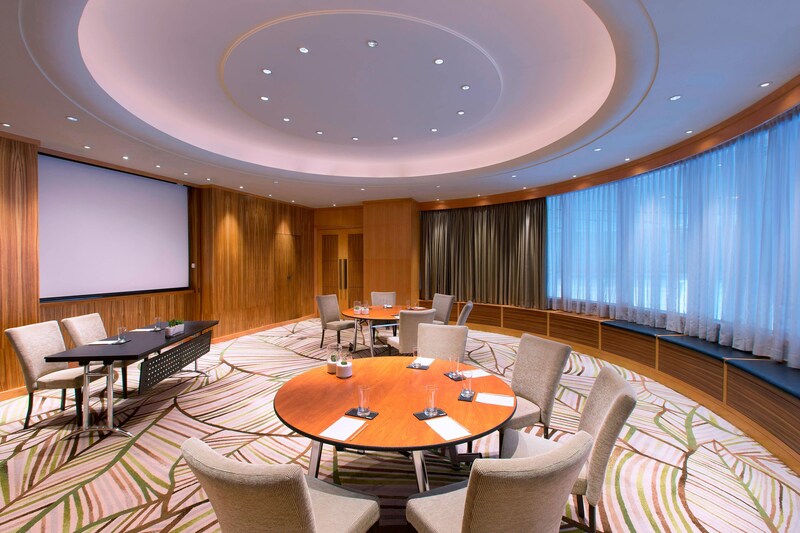 Formal meetings can also be held in our eighth-floor meeting rooms, which share a pre-function area, or in our boardroom, which is bathed in natural light. Treat your taste buds at one of our well-appointed Sukhumvit restaurants. Indulge in a gourmet hotel buffet of international flavors at Seasonal Tastes, our all-day dining venue. Discover both traditional and contemporary Japanese dishes in an intimate, authentic environment at Kisso Japanese Restaurant. 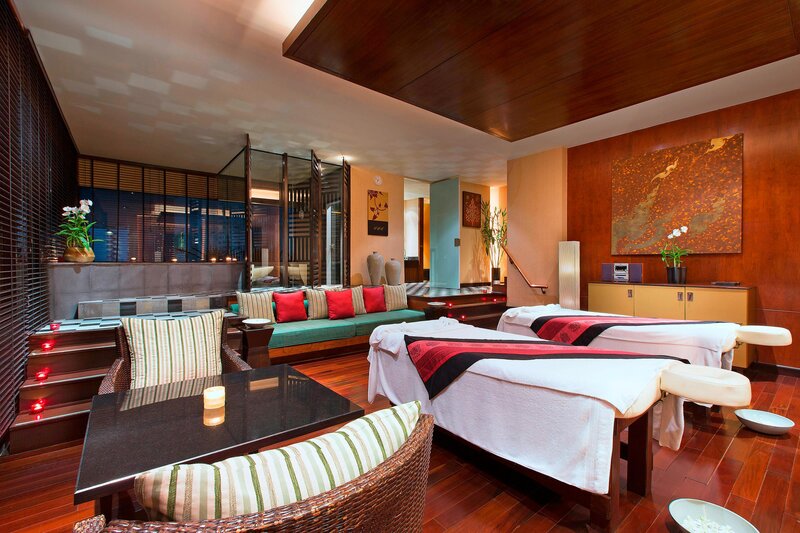 Also to sip in style, stop by Zest Bar & Terrace or lounge under the Thai sun at The Pool Bar. Enjoy exquisite Japanese cuisine enhanced by the drama of an open kitchen, at the sushi bar and charcoal grill, or in one of four private dining rooms, tatami and western style. Fuel your day at Seasonal Tastes, our all-day contemporary restaurant serving gourmet international cuisine. The restaurant emphasizes freshness and high-quality ingredients for a modern health-conscious lifestyle with many international dishes cooked "à la minute." Revive your spirit and quench your thirst at Zest Bar & Terrace, where breathtaking views of downtown Bangkok and Sukhumvit Road appear through floor-to-ceiling windows or out on the intimate terrace. As at all Westins, guest wellness is a priority. The WestinWORKOUT® Fitness Studio is open 24 hours a day, offering State of the art LifeFitness®cardio machines, weights and an array of strength machines. Complimentary fitness classes are also offered Monday through Friday. Enjoy an exhilarating swim in our 227-square-meter rooftop pool, with a picturesque waterfall. Filled with salt water, it overlooks Bangkok’s spectacular skyline. For truly inspiring leisure, retreat to the adjacent Pool Bar and order a refreshing cocktail to sip as you watch the stunning Thai sunset. Vareena Spa’s seven treatment rooms, hydrotherapy room, Vichy shower, aroma steam room, and VIP spa suite offer a serene design and a range of unique treatments blending contemporary and ancient techniques. One visiting Bangkok will never run out of things to do in Sukhumvit as it is a place for the whole family. Nowhere else can you find such an exotic mix of old and new tourist attractions and activities than in Bangkok. Majestic sacred temples stand proudly alongside towering skyscrapers while commuter boats are still the preferred mode of transport on the busy canals. If shopping is more your style, Bangkok offers some of the largest and most modern shopping centers in Asia boasting a mix of local designers and international labels. The Chatuchak weekend markets and the renowned floating produce markets are not to be missed. With culture, shopping, and dining, your visit to Bangkok is sure to be an enriching and rewarding one.